I have been making baby food for my little munchkin since she started solid foods. It's cheap, it's easy, and it's healthier, so I didn't even give it a second thought. I've been surprised, though, by the number of other new moms who hear I am making baby food and seem to be at a loss, asking me how I do it. So enter blog post. It is so, so simple that I encourage you to give it a try. In this post I'm just going to give a few general guidelines for making a few types of baby food from fresh and frozen produce. Take this information and run with it! Change it up, make it your own, and have fun! I encourage you to experiment with different recipes--and then leave me a comment and tell me about it. I love comments! To make purees, you will need an immersion blender, food processor, or blender. I've done it multiple ways, but my favorite way is with the immersion blender. I have Cuisinart's Smart Stick and LOVE it! They didn't pay me to say that or anything, it's just the truth. :) I have the blue-ish one, and it's so pretty, which makes it even more fun to use. You will also need some type of baby food storage system. My favorite is OXO's tot block system. Again, no money coming in from them on that one; it's just the best system I've found. Some people use ice cube trays with covers on them, but what I love about the tot blocks is that they serve as a storage/freezing container as well as a serving container. I just pull what I need out of the freezer and defrost it and feed it to my daughter right from the container, which means less dishes. Less dishes = a much happier momma! I started by having a huge baby-food-making party, in which I chopped/boiled/baked/pureed until I had filled my freezer with adorable little blocks of baby food. 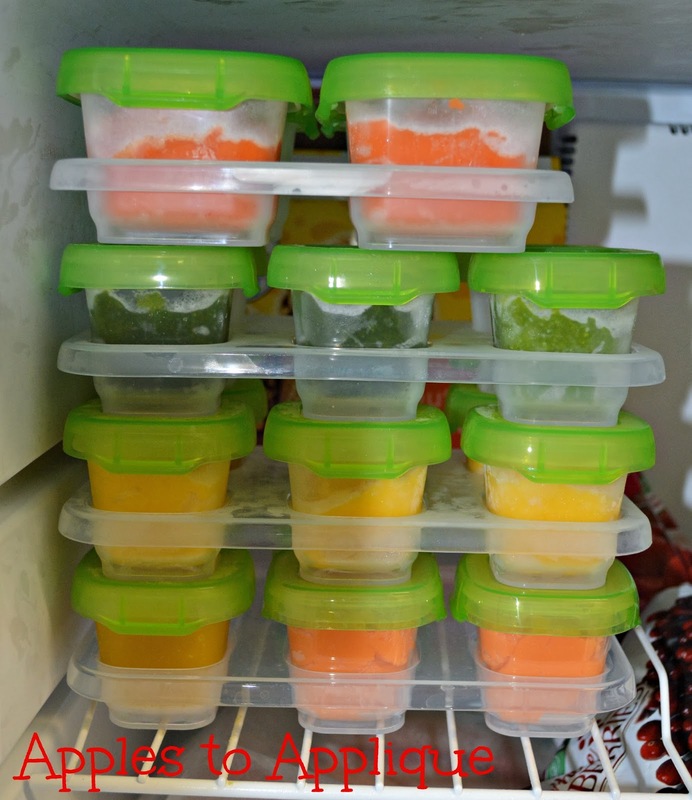 Once that initial job was done, it has been easy to keep my freezer stocked by spending about 20-30 minutes roughly two or three times a week making baby food. That's it! It's up to you if you would rather use fresh or frozen produce. I like fresh for a lot of things, but frozen has its advantages, too. If something is out of season, I can just buy the frozen. Plus, the frozen stuff is already chopped up, which is a huge help with things like mangoes, which are a pain (and are also currently out of season). I also prefer frozen for things like peas and green beans. I don't personally use canned vegetables to make baby food, but of course that's an option, too. For frozen fruits, I simply thaw out the fruit and then puree it before spooning it into the storage containers. No need to cook those! Fast and easy! When using frozen vegetables, I boil them according to package directions (usually going by the longest time, or sometimes a couple minutes longer, to make sure they are good and soft). Then I drain them and put them in a blending cup. I puree them just as they are--no water, seasonings, anything. If, after pureeing them, the vegetables seem to be a little thick, I do add water at that point, just a couple tablespoons at a time, giving it a good blend between additions. Some vegetables don't need any water, and some seem to need a bit more. I never make my baby food as runny as the store-bought stuff, though. I bought a few jars of that to feed my daughter on a recent road trip, just for the convenience, and it was like trying to feed her soup! What a mess! 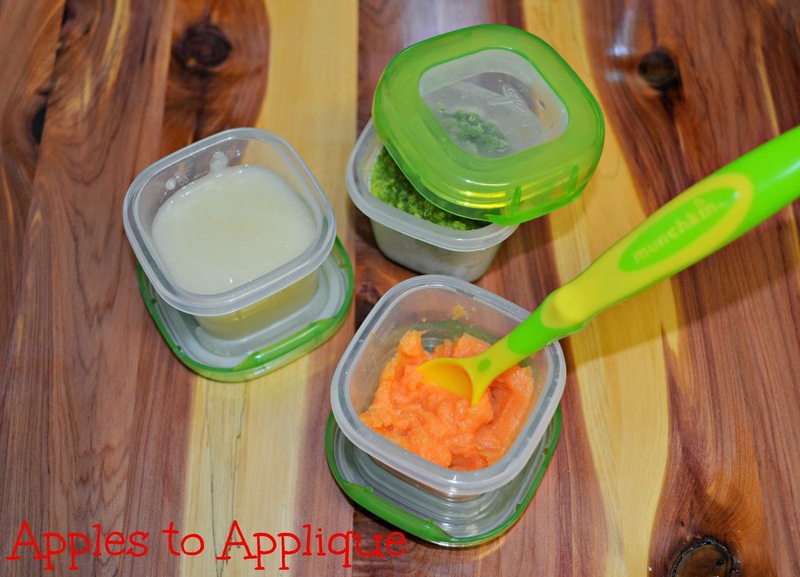 After the puree has reached the texture you prefer, spoon it into your storage containers. The tot blocks have the ounces marked on the side, so I like that I know how much my daughter is eating. It really helps when her pediatrician asks me at checkups! These are just so cute! I love seeing the darling little blocks filled with the brightly-colored food. The color seriously looks so much better than the store-bought stuff. Some fresh fruits can just be peeled and chopped, then pureed--like peaches or plums. No need to cook those. Other fresh foods I boil or bake, depending on what they are. To make applesauce or pear sauce, I peel and chop the apples or pears. Next, I boil them until they are soft and then drain them. Finally, I puree them exactly as they are, without adding any sugar or anything. And into the little storage blocks they go! I then chop it into pieces and remove any brown spots with a knife before pureeing. Sweet potatoes are usually pretty thick and pasty after they're pureed, so I add a decent amount of water to them. 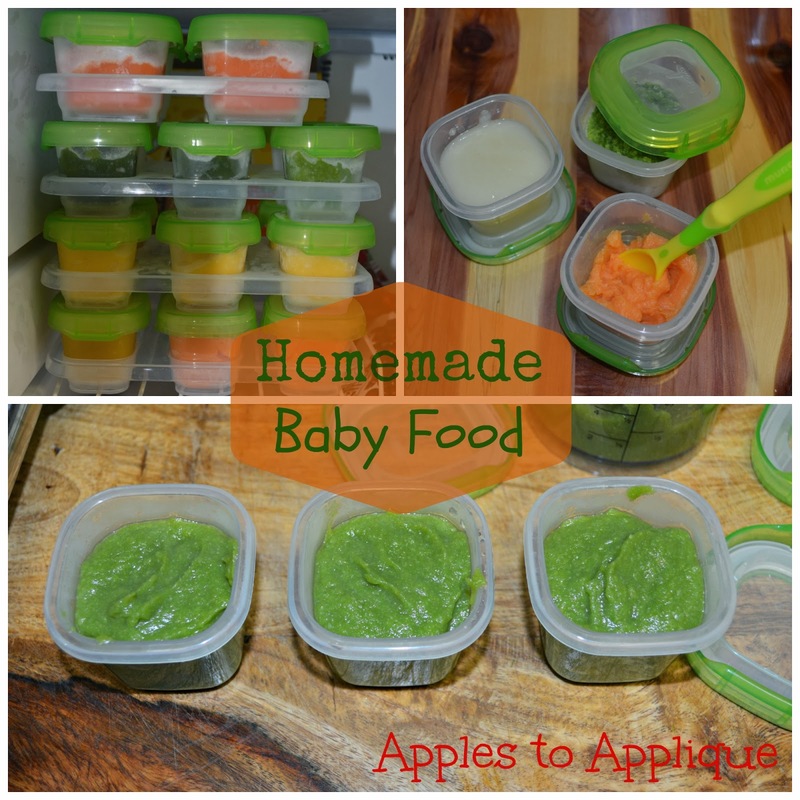 So there you have it, a basic guide to getting started making homemade baby food. Of course, there are many, many more types of fruits and vegetables I haven't covered here, but I hope this gives you a good starting point, and the confidence to make all kinds of baby food. I hope you find it helpful and that you have fun feeding your little one! It looks like I need to get an immersion blender. Thanks Amber for the post. Going to do this with Hunter in a couple of months. I love making homemade baby food for Chloe! Her favs are sweet potatoes & butternut squash. I even make beets...but if she spits any up in public it will really freak someone out! Glad you found it helpful Lindsey! It is really so much cheaper (and healthier) that it's worth the small time commitment to me.